We arrived in Bangkok after an absolutely charming flight aboard Sri Lankan Airlines. In fact, after that experience, and after meeting a lovely couple who had just been in Sri Lanka, it has just jumped towards the top of our list as a must-see place on this trip! We had an easy trip through customs (despite the fact that we have a 30-day visa here and we don't have proof of when we're leaving), and then it was time to figure out how we were going to get from the airport to our hotel, the Chatrium Hotel Riverside. We had read in many tour guides about a trend in Bangkok for taxi drivers to over-charge or try to negotiate a super high fare instead of using the meter, so we were on high alert to not get taken for a ride. Turned out to be pretty easy from the airport, as the government has clearly figured out that it is not in their best interest for tourists (Thailand's biggest industry) to be fleeced. So they have quite the set-up at the airport to ensure only above-board taxi drivers even have access to tourists (it would not turn out to be the same in the rest of Bangkok, unfortunately!). On the drive to the hotel, we got quite a visual overview of Bangkok, and our first impression was that it was far cleaner and more modern than we were expecting (and cleaner and more modern than Hong Kong, which I was certainly not expecting! 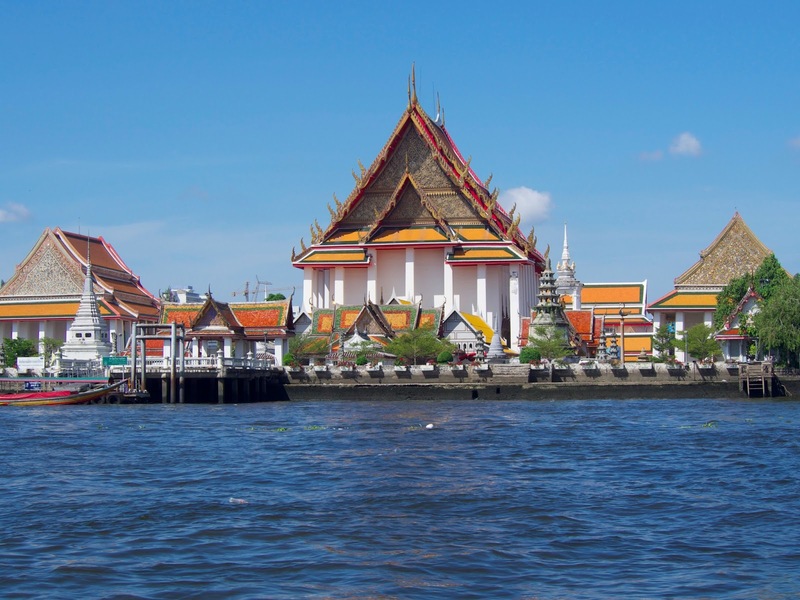 ).There are 8 million people who live in Bangkok (same size as London or New York, and 10 times the popultion of San Francisco! 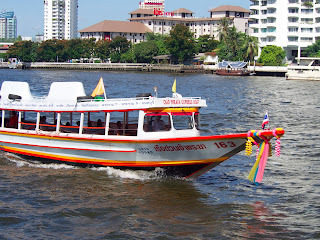 ), and the only real geographical feature to the city is the Chao Phraya river, which winds through the city. 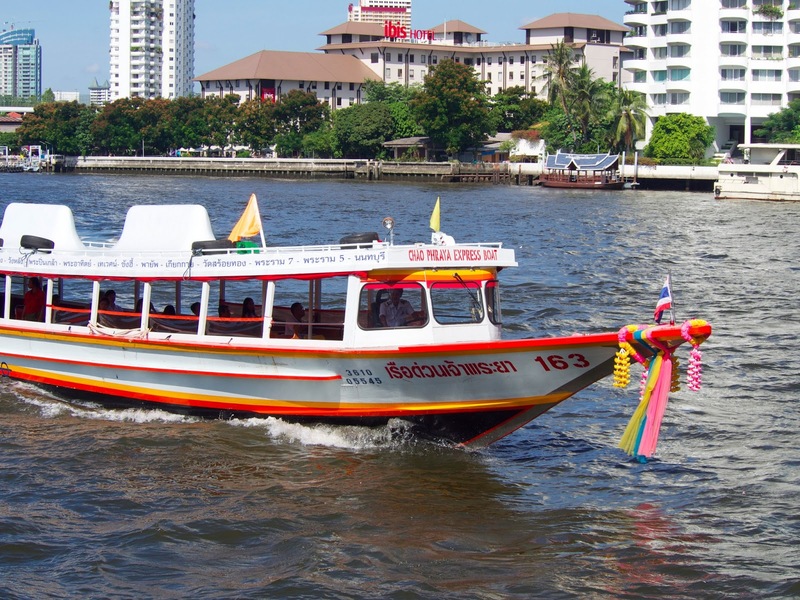 The traffic in the city is so bad (and the taxi drivers generally behaving deplorably with tourists) that the best way to get around is via the river boat express. It's basically a bus whose route is the river, only it's a boat! Awesome. 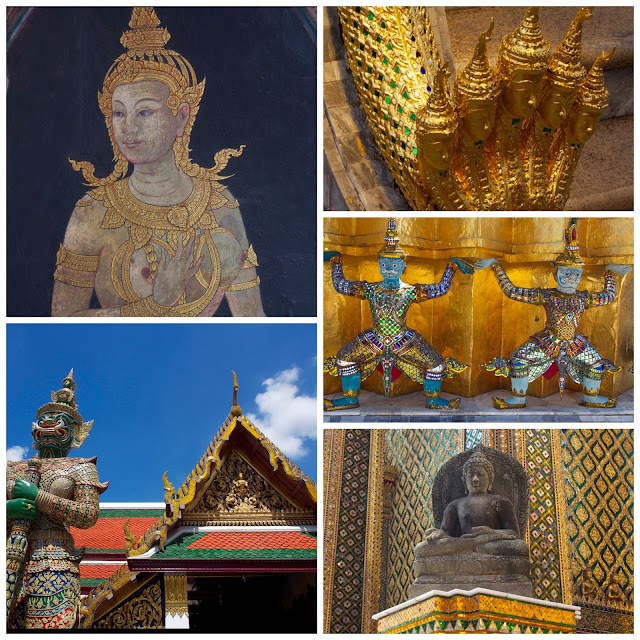 As for the daytime activities, we went to the Grand Palace, which is known as the one place you should go if you're going to see anything in Bangkok. And it was overall a good experience, though I'm still not sure it was worth the money. It is the beautiful temple and attached palace where the king used to live. And it is free for all residents of Thailand, which I believe to be an excellent thing. In order to pay for maintenance, they charge foreigners...500 baht each (about $15 USD). On the scale of Thai prices, $30 is a lot for some sightseeing in oppressive 100 degree heat! Plus, we bough audio guides for another $15 before we realized it was so hot we wouldn't want to learn anything. So, the temple and palace were beautiful and we learned a few things, but I might think twice about it on a return trip, as there are about a million gorgeous temples all across Thailand. After that costly experience, we elected to go light the rest of the weekend in Bangkok. After a death march to Dusit Park (which turned out to be another oppressive heat/steal all our money kind of thing), an attempt at some cab drivers to fleece us, a metered cab driver who drove us around until we made him let us out - not at our desired destination, Molly losing her iphone, we decided it was time to go to the hotel and stay there in resort mode until it was time to take the train to Koh Tao for some seriously relaxing time at the beach.